Elizabeth Kreutz is having some Fall: on Thursday, she had her first baby, a boy named Charlie (photo here, with Dad here). Meanwhile, early copies of her latest book project, Comeback 2.0: Up Close and Personal , are shipping, a little in advance of next week's official release date. The book pairs Lance Armstrong diary entries with a healthy and delicious serving of Kreutz's photos of Armstrong's comeback. 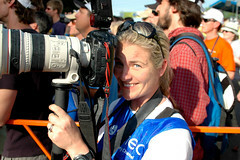 At right, Liz at the finish of the 2006 Tour de Georgia, champagne-testing the Canon 1D. The photographers' pen is probably the second-favorite target for race winners, after the podium girls, and I think Liz bore the brunt of the Discovery Channel's team classification win (Floyd Landis took the overall, and Discovery pretty much everything else). Liz is on Twitter: @LizKreutz, and here's her website.